ACI & ODO Workshop Dates Announced! Airports Council International (ACI) and ODO will host the Accommodating Passengers with Disabilities (APD) Workshop twice this year, the first at MSP and the second at CVG. This 3-day course provides an introduction to US disability rights legislation, architectural accessibility standards, the latest regulatory changes, and also highlights new technologies, resources and best practices from airports worldwide. PaxAssist is officially launching its non-metallic JetWeels on Feb. 28 at JFK. The polycarbonate plastic wheelchair enables quick, easy and safe access through metal detectors. JetWeels are stackable and feature a safety belt and baggage tray. The first production batch will be available for purchase by mid-March. Read more. ODO is excited to announce a partnership with Aira to expand the availability of Aira technology in public places, benefiting individuals with vision loss worldwide. Aira provides its users with personal, on-demand, and professionally-trained sighted guides called Aira agents, who assist users with wayfinding, reading printed text, and finding nearby places of interest. Visit Aira’s website to learn more! January 3, 2019 was a dark day for the aviation industry with the loss of Southwest’s co-founder, Herb Kelleher. Herb exemplified what aviation should be.. he made flying not seem like the commodity that it is. He was good to his customers and great to his employees, all of whom loved him. It’s with heavy hearts that we say goodbye to a pioneer but we are hopeful that other leaders in the industry follow in his admirable footsteps. Open Doors Organization is the recipient for 2018 of the TSA Disability & Multicultural Coalition Partnership Award. This is the second time that ODO has been recognized for its work with the TSA in improving the screening process for travelers with disabilities. 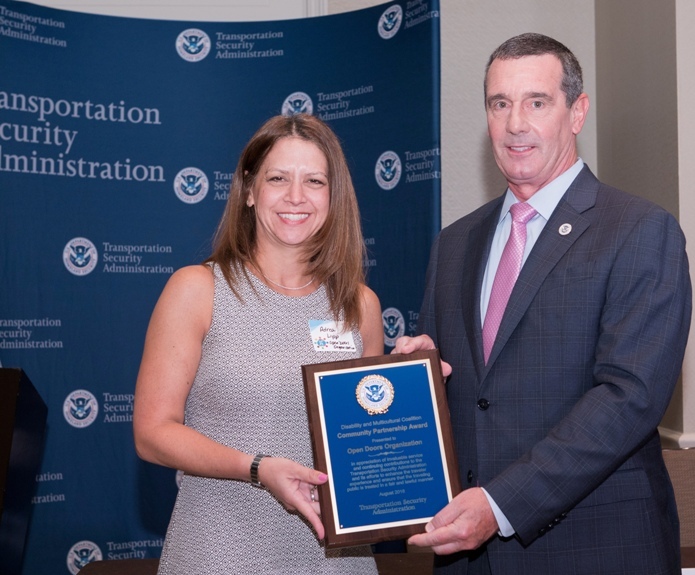 The award ceremony took place at the 16th Annual TSA Coalition Conference, held August 7, 2018 at the Ritz Carlton in Pentagon City, VA. Presenting the award to Adrea Lipp, ODO Director of Operations, was David P. Pekoske, TSA Administrator (shown above). 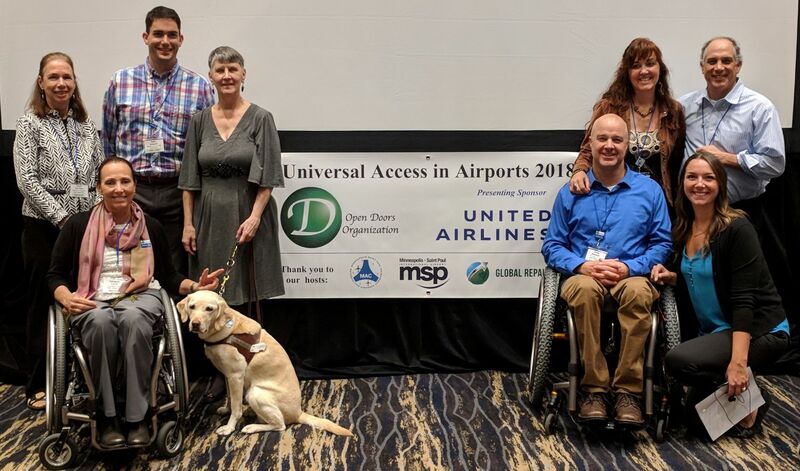 Open Doors Organization is lead investigator on a new Airports Cooperative Research Program (ACRP) project entitled Innovative Solutions to Facilitate Accessibility for Airport Travelers with Disabilities. It’s a broad topic and an exciting one. Partnering on the research, which kicked off July 2016, are Alliiance, Arora Engineers, Trillion Aviation and Indiana University. In addition to a literature review, ODO will be conducting surveys of aviation executives and travelers with disabilities, carrying out interviews and site visits at a number of airports in the US, Canada and Europe and holding focus groups on user needs. The guidebook will be published in 2018. We’re delighted to announce that Open Doors Organization has won a competitive bid to develop and deliver ADA training to Amtrak frontline employees and supervisors nationwide. Under the 3-year contract, we will once again hold classes in numerous cities across the country, drawing on our network of skilled trainers from each region, many of whom have a disability. To make the curriculum as useful and practical as possible, one of our first steps will be to get input both from Amtrak supervisors and members of the disability community. We also plan to create videos modeling best practices in communication and assistance for customers with a range of disabilities. Our end goal: to create an exciting, interactive training that helps Amtrak employees, whatever their job, provide the best possible customer service to everyone. In conjunction with the ADA 25 Celebration, Open Doors Organization has released its much anticipated 2015 Market Study. It confirms once again that this is a strong market that’s still growing. American adults with disabilities now spend $17.3 billion annually on just their own travel. Conducted by Mandala Research, the 2015 Market Study is a follow-up to ODO’s groundbreaking 2002 and 2005 surveys. New this year are an expanded section on cruise travel and data on the use of mobile technology and ride share services. The 53-page report is available for sale on the ODO Academy website. Laurel Van Horn, Director of Programs.